The way drag acts on an intertidal seaweed like Durvillaea changes as the algal body is moved by a wave. A passing wave agitates water particles in a circular orbital motion. As the water depth decreases near shore, the circular motion becomes more and more elliptical . In shallow water, waves can thus cause a simple back and forth swaying of seaweeds. This swaying can be described for both Durvillaea species by two extreme states and a series of intermediate ("midsway") positions. 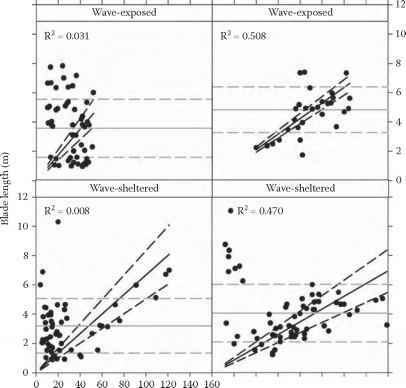 FIGURE 3.12 Time series (A) wave gauge data of water surface elevation and (B) along-blade accelerations offset by 1 unit from their mean value. Accelerometers 1 (palm) and 2 (blade) are from the D. antarctica sample and accelerometers 3 (palm) and 4 (blade) are from the D. willana sample. The water surface elevation is contaminated with foam during extreme nearby breaking events (e.g., 772 s). 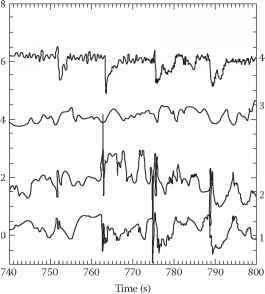 In addition, the wave gauge and samples were not exactly colocated in space, and the fronds themselves have a finite scale so that the peaks in elevation do not exactly correspond with the accelerometer responses. area. Mainly pressure drag is acting on the seaweed, pushing its body downstream. As Durvillaea is reacting to the drag, it starts to reconfigure its blade relative to the flow, exposing more and more area normal to the flow direction. 2. Midway between the extremes, the algal body is comparatively upright in the water column. The main area of the blade is thus normal to the flow. Subsequently, pressure drag is acting on a large surface. Although drag could be expected to be high, the resulting tensional forces will be low as long as the blade can deflect further ("going with the flow") . FIGURE 3.13 Lattice plot of the maximum diameter of the stipe and the length of the blade for D. antarctica and D. willana, grouped by species and wave exposure. Dashed lines represent the 95% CI. 3. The algal body is outstretched along the direction of the flow. The area normal to the flow is comparatively small again (projected area) so that the pressure drag is low. The friction drag, however, is comparatively high as water is pushed along the surface of the thongs of the blade so that the planform area is the relevant factor. The overall drag will often be less in this position than in the midsway position (2), however, because the blade cannot deflect any further, the reactive tensional forces will increase. Because the shape of an individual Durvillaea changes and because the drag acting on the body changes, a constant drag coefficient cannot be expected. Although the real situation in the intertidal zone is more complex, in particular with breaking waves, these assumptions seem sound as a first-order approximation, and the morphological parameters, which can most reliably predict drag, need to be identified. FIGURE 3.14 Lattice plot of the length of the stipe and the length of the blade for D. antarctica and D. willana, grouped by species and wave exposure. Dashed lines represent the 95% CI. The maximum forces obtained from drag tests in a flume were comparable to forces recorded during field experiments with transplants of Durvillaea at 300 N . Based on Equation 3.1, area is expected to correlate well with drag. Unfortunately, the common approach of taking the projected area is of little use if the study organisms change their shapes by reconfiguring into streamlined bundles with increasing flow velocities. Therefore, the planform area is often taken instead as the characteristic area, but this does not account for undulations or corrugations typical of many seaweeds [28,29]. A third approach is to take the wetted area as the characteristic area . In the case of Durvillaea, however, the determination of the wetted area is extremely difficult for individuals with wave-exposed morphologies because the blade is reconfigured in such a way that parts of the surface areas of neighboring thongs will be in close contact on the "inside" of the streamlined body. The contact area will subsequently not act as a friction surface for the surrounding medium, and drag forces will be lower than could be expected from correlations with the wetted area. 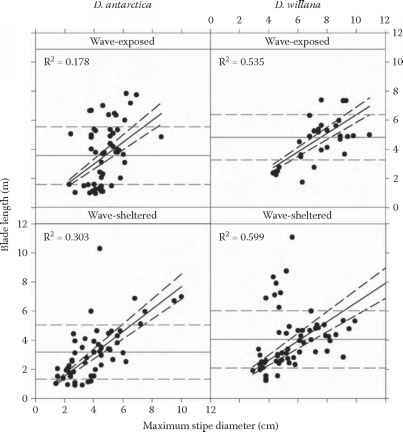 The highest correlation for D. antarctica between drag and morphological parameters was with blade length combined with information about the type of wave-dependent overall morphology. The highest correlation of the Vogel number was with mass. It seems therefore justified to expect that the best predictor of the way a given individual will behave in different flow regimes and at different velocities will be a combined factor of length, mass, and overall morphology. The factor would be an expression of the "bulkiness" of an individual. 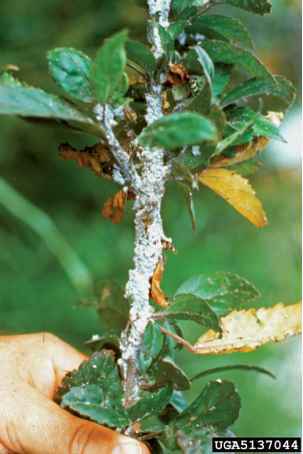 The importance of an adapted morphology and its bulkiness is clearly demonstrated by the shortening experiments. The original shapes of the tested specimens were well adapted to high flow velocities. The experimentally shortened blade prevented a reconfiguration into a streamlined bundle and resulted in drag forces that were higher than could be expected from the results of the flume tests on intact individuals. The importance of the bulkiness factor is further supported by the two outliers in Figure 3.7. The individual above the 95% CI was previously damaged, probably in a storm. The shortened blade was very "bulky" with many thongs, resulting in disproportionately high drag. The other outlier below the 95% CI also had fractured tips. Although missing large parts of its blade, a few thongs had remained unbroken. The blade was subsequently very long, whereas the bulkiness was very low. These two outliers demonstrate the shortcomings of simple morpho-metrical measurements for correlations with drag because a similar line of argument could be applied to area or mass as morphologically relevant parameters. Although intuitively easy to understand, the quantification of such a bulkiness factor is complex. Approaches that involve the determination of the "branchiness" of a lamina, similar to a fractal analysis used in computer models of algae, seem plausible but not very practical for seaweeds of the size of Durvillaea. Other and simpler methods still need to be developed to describe the intricate shape variations of these seaweeds to predict drag based on morphology.